The Place Beyond the Pines Is Where I Wanna Be! 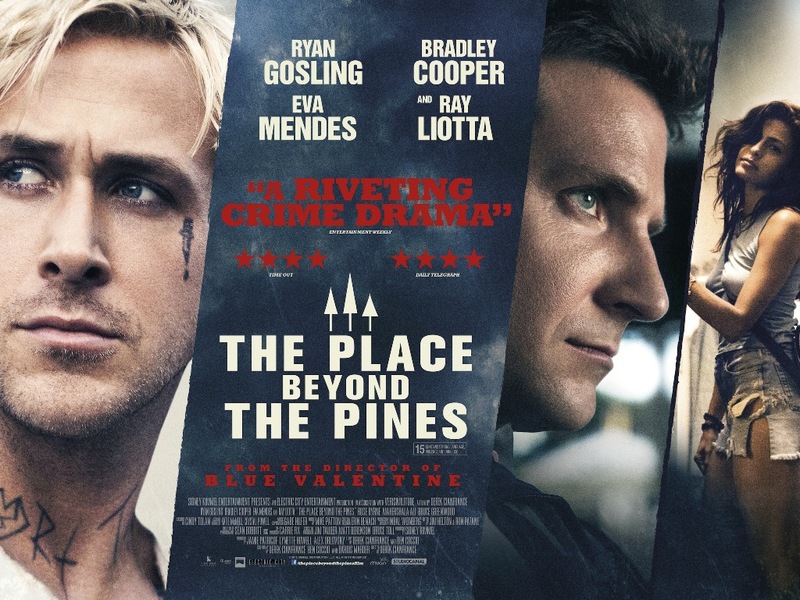 This past weekend, I had the pleasure of viewing “The Place Beyond the Pines” and I was not at all disappointed with this film. Seriously, I don’t think I can express just how good this film was. I had been following it from the first trailer and once I saw that it was finally in theaters, I knew I had to see it. “The Place Beyond the Pines”, directed by Derek Cianfrance stars Ryan Gosling as Luke, a motorcycle stunt driver who travels with a circus as Luke and the Heart Throbs, doing all sorts of insane stunts. Somewhere near Schenectady, Luke has a fling with Romina (Eva Mendes) and comes to find out that she had a kid, Jason (Anthony Pizza) and it is his. Determined to do the right thing, Luke leaves his motorocyle ways behind and decides to stay to take care of his son and keep away Romina’s boyfriend, Kofi (Mahershala Ali) from trying to raise his son. A chance encounter leads to Luke meeting with Robin (Ben Mendelsohn) who helps Luke with his financial problems by offering his assistance in robbing banks. Luke decides to take Robin up on his offer and that’s when law enforcement gets involved. Avery (Bradley Cooper) becomes involved with investigating the robberies and to say anymore would not give this show the justice it deserves. Let me start by saying that the flow of the story lines, because there are several, is particularly well done. There wasn’t a moment within this film that I questioned what was occurring on screen. Not a single moment. Everything occurred organically and conclusions were reached realistically, nothing was rushed, everything developed. Some of the shots in this movie appeared tremendously well thought out, they appeared as if they were moving paintings and just gave me the chills as to how much they showed without saying anything. There are some great shots that occur within the woods that were beautiful and currently make me want to capture those stills and hang them on my wall. Every single person in this film is ambiguous. Nobody is all good or bad, they are just real. The way the story unfolds is that you get to witness these characters at some high points within their life and at some very low points and the decisions they make within those moments shape who they truly are. It’s as if, I don’t know, this movie was set in reality. It was as if this movie was supposed to be about real people. Just like, oh I don’t know, “Blue Valentine”, which was directed by this same director. The way he expresses and captures humanity in this film and “Blue Valentine” tells me that Cianfrance, really understands how people act. He knows what they say, what they do, how they speak, what they mean. I felt like this story could have existed outside of the film and I would have found it incredibly heart-breaking. Bradley Cooper really brings it, in this movie. He portrayed his character with conviction and an understanding that I don’t believe I saw in “Silver Linings Playbook”. When his character suffered, he suffered, when Avery was mad, Bradley Cooper was mad. This was depicted in the mannerisms that he presented when his character was pushed up against a wall. It showed in his eyes. Bradley was Avery. Emory Cohen as Aj and Dane Dehaan as Jason. Wow. Cohen made me want to smack AJ several times throughout this film. Nothing upsets me more than a bully who uses his father’s coattails to get what he wants. I hated this character, hated him. Emory Cohen knew what he had to portray and he did it. He also allowed the audience to get a glimpse as to what he was suffering from, what his father had done to him, that made him such a horrible person. He added perspective and again showed how nobody is all good or all bad. Dane Dehaan. What an amazing portrayal of the poor suburban upstater. I went to high school upstate and when the conversation went from covering boredom, to now what drugs do we do, I knew that this actor got it. Cianfrance directed it, but Dehaan knew what he had to portray. A rudderless kid who was looking for friendship and his father. A kid who turned to drugs and drinking because what else is there to do in Schenectady, seriously, I can attest to how much drug usage there was in my high school. He had this haunted pained look on his face, because he was in pain. He was alone and had no idea what he was going to do with himself. What a remarkable performance. So I know I said this a few times already, but check this movie out. You won’t regret it.